I don’t accept all of their criticisms about how I should have organized the book (not everyone understands the problems in higher ed as well as education professionals), and I don’t really understand why in a discussion of the future of education I should have to choose between talking about how institutions are adapting and how people are adapting outside of institutions, but I definitely agree with Jon Becker et al that “a huge missing set of voices in DIY U is that of the students, current and future.” If there was one thing I could have done differently in the six months I spent researching and writing the book, it would have been to talk to more students as I did with Generation Debt, or at least to include more of the informal conversations I’ve been having with students, graduates and dropouts for the past four years. If you want to hear from students, you should check out the book on Scribd, Speak! The Miseducation of College Students, a collaborative project by students at Baruch College, the country’s most diverse, who are students of Anthropology professor Kyra Gaunt.They worked hard on short essays expressing their passions and their frustrations. They want more resources, more relevance, more recognition for their achievements. The straight up cost of tuition does not get them down as much as the cost of textbooks they never use and the financial burden they place on their families by being at school instead of at work. These are the front line college students who are the new normal in higher education. my thing! Math is what my career is based on because that is my passion. How could I have failed a math class?” writes Daisy Mendez. “It’s a catch 22 when I sit and talk with someone and they express their shock that I am so articulate and knowledgeable. I want to feel appreciation for the recognition of my intelligence, but I also feel disgust because it should not be seen as a phenomenon,” writes the volume’s editor, an African American named Malcolm Johnson. In the fall I go back on the road to speak on campuses. I’ll be posting more reactions by students–and non students–in this space to the ideas of DIY education. Thanks, Anya, for bringing attention to our review and bringing it to a space where we might have a discussion. I’d be interested in reading a more detailed version of your first sentence. Which criticisms do you accept and which do you reject? You wrote, “…how I should have organized the book (not everyone understands the problems in higher ed as well as education professionals).” I’m not sure how the parenthetical statement follows from the statement about the organization of the book. Also, WRT choosing between “talking about how institutions are adapting and how people are adapting outside of institutions”…I hope the review doesn’t suggest that you *had to* choose. Rather, the point we tried to make was that the two notions are too frequently co-mingled, and neither is fleshed out enough. I think, as a result, one thing I’m seeing across various reviews, comments, etc. is that it’s never quite clear what “DIY U” *IS*. Is that a fair critique? Well on structure, I simply disagree that I spent too much of the book dissecting the problems in higher ed, and according to many reviewers and folks on Amazon, my dissection of the problem was the strongest part of the book! Most people outside higher ed don’t understand the details of the crisis very well. I think even you who are employed in higher ed and familiar with many aspects of the crisis, miss key things about the true nature of what’s wrong, because you bring up a couple times the fact that enrollment is strong and growing. The fact that students are lining up doesn’t necessarily mean that the system works well or that students, barely half of whom complete a four-year program, are well served by what exists. And increasing enrollment can only hurt the cost picture because each student in a public system costs the institution money. I tried to separate discussions of change within and outside existing institutions by taking them up in separate chapters, which many reviewers seemed to feel was a fine way of doing things. However, most of the “edupunks” are employed by or enrolled in existing institutions, and 99% of the edupunks and edupreneurs are at least graduates of existing institutions. That’s not so surprising, really, when you think about the ramifications of renewal and reinvention of an existing system that is so pervasive throughout our society. 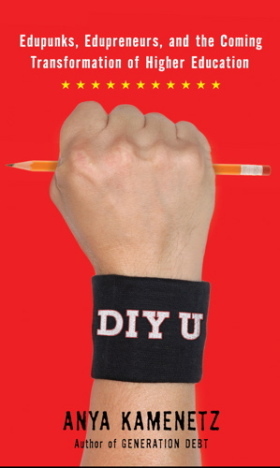 On what DIY U *is*: I didn’t define it for a reason. It has to be different for each person. That’s the whole point of doing things yourself. And besides it’s way too early to pick a winner from existing innovations. That was absolutely my intention because I would sound like a nitwit making Nostradamus-like predictions about this stuff. But in the end, I basically think you’re right that the book may be too superficial, or just may not be of much use to the readers of Couros’s journal and others who are deeply, deeply embedded in ed tech. I mean I interviewed and quote from the work of many of the authors in the very issue of the journal in which this review appears. My intent was to introduce your work to a much wider audience so that parents, students, prospective students, educators, policymakers, investors and businesspeople and employers, all of us out there in the wider world who have a stake in what happens inside the academy, would have some idea of what’s cooking. Anna, great work an ancillary thought, the dysfunction of our academic institutions permeates innovation and entrepreneurism as well and this is deadly. I believe this could be great stuff for another book. In your vein, the connectivity, and maverick “hack” technology is pervasive today and should be allowed to take root. The DIY University can easily be a garage and a tiny fraction of the price to the taxpayer. “the book may be too superficial” Another great reason to make it a free E-book. I’m still waiting for my free copy. Also, is it reasonable to believe that everyone who enrolls in college and does not graduate fails because the institution has somehow not “served” the student? Perhaps you have Utopian ideals that everyone who goes to school will be successful or the system has failed to do its job. That’s almost like saying every mentally handicapped student will become an Einstein or the system has failed them. “…all of us out there in the wider world who have a stake in what happens inside the academy” I don’t know if I believe that anymore than I believe we all have a stake in what the military does. Some things are not in the public’s control because that would be foolish.